I mean- It's Mary Beard. Much like Kurlansky but for history, if she writes a book, I want to read it. I actually read this one from the library and loved it so much I ran out and bought a copy. We have so many mis-conceptions of Rome and it's people, ranging from the harmless to the racist to things "everyone knows" that are just plain false. Beard lays bare what we know and how we know it in a way that is both readable and informative. 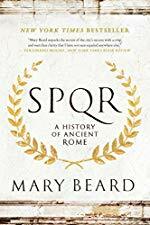 She also pays close attention to the women and slaves of Rome, who were integral to the working of the empire, but in the minds of past male historians, might have never existed. In 50 years this book will be considered a classic. This is relevant to my interests and I look forward to tracking a copy down. So, I just grabbed this for my Kindle and I'm super excited to read it. But I do have to confess that I bought it because I saw the author's name and somehow managed to confuse her with Mary Roach. It does have the Mary Roach-esque quality of making you put it down every few minutes to ask the nearest person, "wow, did you know that--"
It's quite good; I'm not sure I agree with her decision to start in media res and then backtrack. Sounds interesting. I ordered this. Will report back. An absolute masterpiece, one of my favorite books of all time, and honestly has somewhat ruined my ability to read most popular history non-fiction, as everything else suffers in comparison. She paints a stunningly vivid picture without resorting to conjecture, though she does indulge in the occasional flight of fancy, she clearly calls it calls it out as such. The theme she returns to - "What does it mean to be 'Roman'?" - is painfully applicable to life as a modern American (and, I suspect, Briton/Italian/German/Korean/etc). I particularly appreciated learning about the ways the Romans mythologized their own history for propaganda, while at the same time operating in direct contradiction to the ideals they claim to long for. She also writes a lovely column/blog called A Don's Life, but to be frank, I'd read the instruction manual for my TV if I knew she wrote it.